Where do the children ride? This is Flo. She’s my daughter. She’s nine years old. I think and I hope she’s learning to love cycling. The question I ask in this post, in my convoluted way, is what are the prospects of her becoming, over the next few years, an ‘ordinary’, ‘regular’ cyclist – a young woman who uses a bicycle in order to stitch the different aspects of her everyday life together? 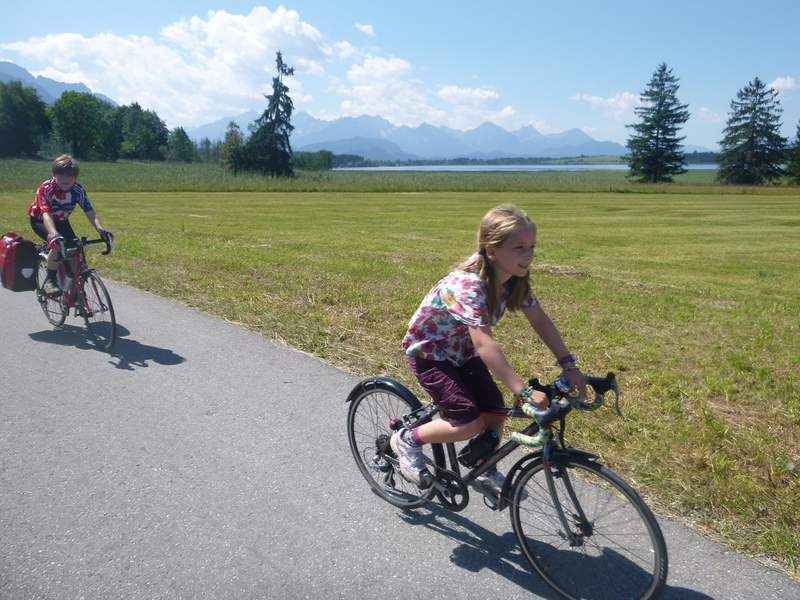 We’re just back from a three-week cycle-camping trip to Bavaria. It was Flo’s first cycling holiday riding her own bike. Two years ago we made this same transition with Bobby, who’s now 11, by heading to south-west France. He took to solo riding brilliantly, and he continues to be on the whole enthusiastic, if not fanatical, about cycling. But Flo is a less keen cyclist; this year she has done the occasional race, and if we’re going for a cycling day out she will come along (and enjoy herself), but on the whole I get the sense that she rides only because the rest of us ride, and because – as part of a family without a car – she sometimes simply has to, if we’re to get where we want to go. In other words, cycling for Flo is normal, but it’s not actually desirable. She has yet – I think – to discover her own love for cycling. I know there’s no guarantee she ever will. If she doesn’t that is of course fine – she’ll find her own ways to live. But in the short and medium-terms, as she is part of a family which lives without a car yet thrives outdoors, it feels important that we continue to try to cultivate her ability and desire to cycle. However, I think the main difference between Bobby and Flo, though still heavily cultural (and so heavily gendered), is more embodied. Basically, and maybe this has only happened over the past couple of years and Flo is set to follow, Bobby has learnt to be comfortable with – and perhaps even sometimes started to thrive on – bodily discomfort, and I think this ability is indispensable to becoming happily and sustainably active. Before our time in Bavaria, Flo didn’t seem comfortable with the uncomfortable bodily sensations which arise from hard physical effort. I don’t want to succumb to lazy stereotypes of ‘how boys and girls are’, but it does sometimes seem that she gets too much cultural (and gendered) support to maintain this ‘comfortable’ position – particularly from a culture of ‘young girl-ness’ which seems to be threatened rather than validated by sport. Flo and her girl friends prefer to play (remarkably imaginatively and cooperatively) indoors more than out, and tend not to challenge one another to take physical risks in the way that Bobby and his boy friends seem to do (and they’ve both moved much more firmly into gendered social worlds over the last couple of years). And she gets insufficient support to be otherwise – whilst we encourage her to be active, and we have wonderful local cycling and athletics clubs to help, there are strong counter pressures encouraging sedentary inhabitation of the private sphere. 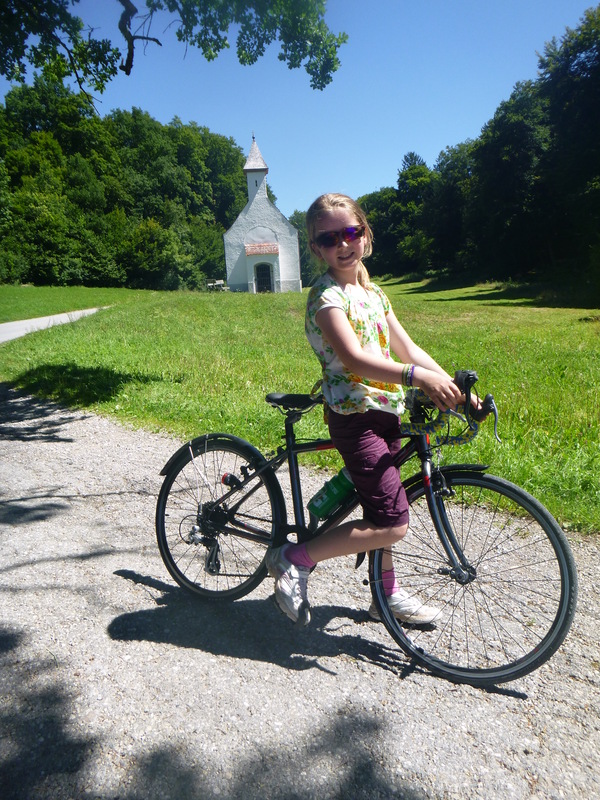 So planning a cycling holiday which depended on Flo’s ability and desire to ride – and to keep riding – her own bike was a gamble. 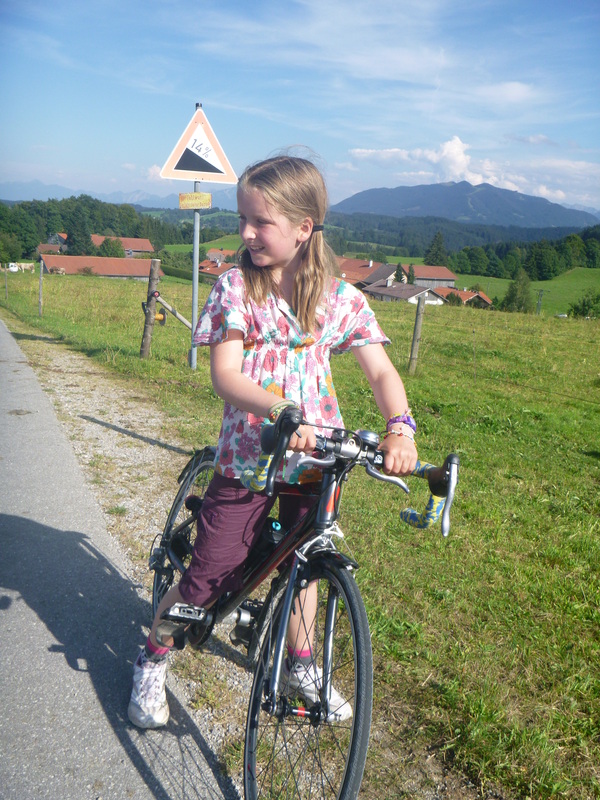 But I’m glad to say it’s one which paid off – Flo thrived on cycling in Germany. Over the three weeks, she amazed me with her tenacity, endurance and skill. She sped across loose gravel surfaces over which in the past she’d have ridden with trepidation. Often coaxed by her older brother, she dug into and excelled on hills which I’d have thought might make her cry, and she looked thrilled with herself when she reached their summits. And often she and Bobby forced the pace, leaving Sue and I struggling behind – laden donkeys on the racecourse. 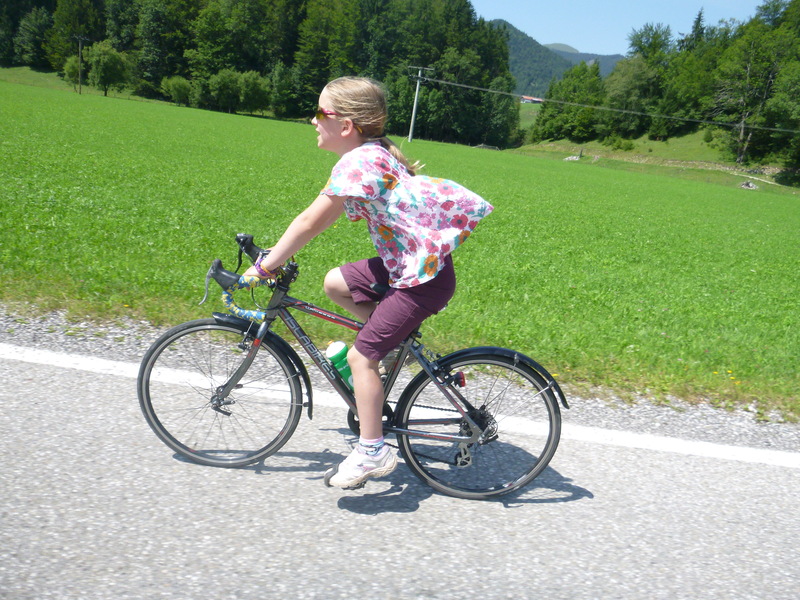 What Flo made me realise is that if only we could take away the factors which constrain our children’s desires and abilities to cycle, they’d be able to attain a freedom, independence and grace we can nowadays scarcely even begin to imagine. Rid of the barriers which operate back at home, Flo was free to fly. These barriers include ‘typical’ ‘girls’ activities’, and TV (or in our case – as we don’t have a TV – the probably slightly less invasive iPlayer) and computer games. They include a socialized aversion to the bodily discomfort which physical exercise produces. But we all know, don’t we, the overwhelmingly significant (I’d be tempted to call it the ‘determining barrier’, were that not likely to see me regarded as a bit too crude and somehow ‘unreconstructed’) barrier? Although key players within (what in my more cynical moments I’d label) ‘the cycling promotion industry’ sometimes seem intent on denying it, the major barrier to all cycling, but children’s cycling especially, relates to space, and how amenable or not it is to cycling. In my admittedly limited and partial experience, Bavarian cycling infrastructure varies, but almost everywhere it puts British cycling provision to shame. And where facilities are less cycling-oriented, driving seems to have been civilised to the extent that it doesn’t matter. We certainly didn’t find a cycling paradise, but we did find ‘a cycling situation’ far ahead of the one in which we’re mired here in Britain. I now understand why my friend and colleague Tim Jones considers Germany more relevant as country which Britain could emulate than the Netherlands or Denmark – whether we were riding along dedicated cycling routes running parallel to big and busy main roads, or pedalling on the road through traffic-calmed town centre streets, I often thought how these quality cycling experiences could relatively easily be reproduced back home. 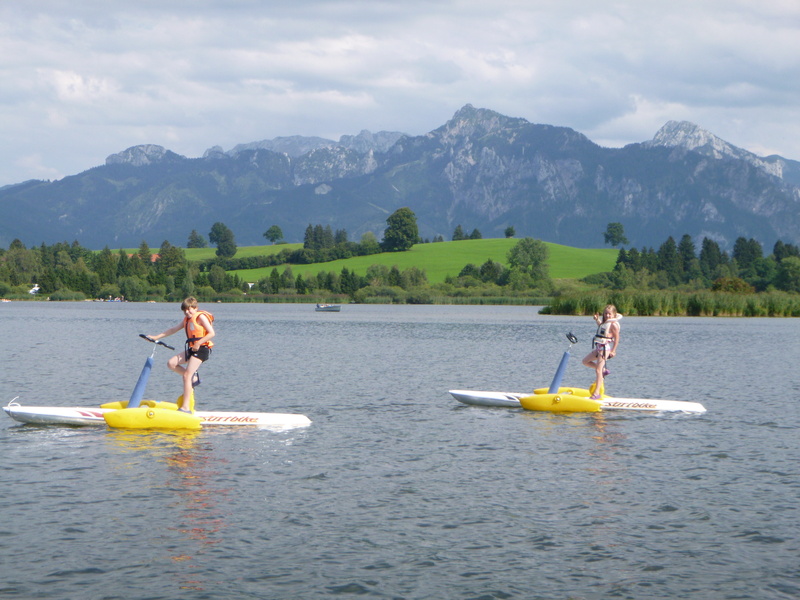 Cycle-touring is very popular in Bavaria. We felt normal! 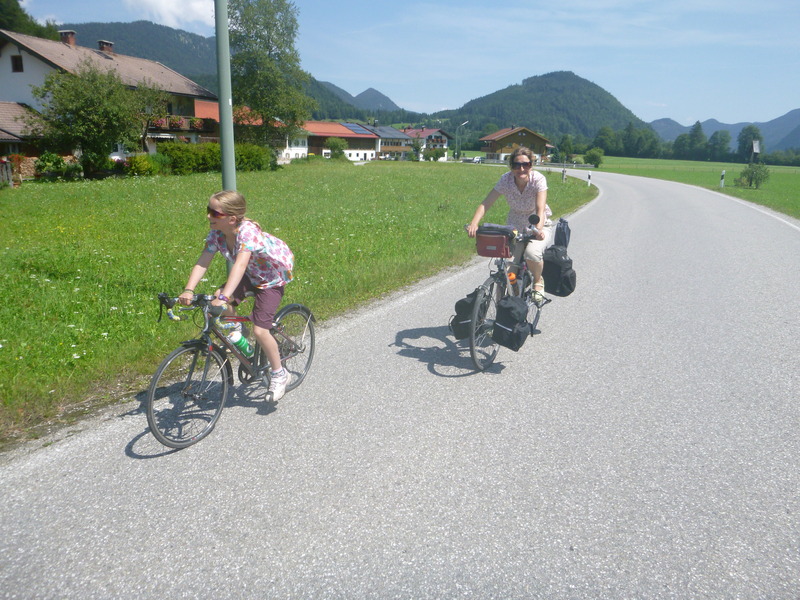 ‘Ordinary’, utility cycling is also unremarkable, although I personally found one sight quite remarkable – in a small town somewhere south of Munich, as we sat in the shade eating lunch and chilling out, we watched a girl of maybe four or five pedal up and back down the main street, several times. She rode completely independently. She looked happy. She looked free. I’m angry about my children being barred from riding where they live. Seeing their own taste for freedom and the freedom which other children enjoy when we go somewhere such as Bavaria helps me to see what’s possible, and thus helps me feel more optimistic. But the clear fact that we’re not moving any closer in the UK towards achieving what’s been achieved in Bavaria makes me angrier still. Each time we’ve travelled overseas to go cycling as a family it has felt to me as though we’ve taken a little step into the unknown. Of course, we know the different reputations for cycling which countries have. We know and talk to people who have cycled in these places. We read guidebooks and websites, and buy maps. But still, we don’t really know what a place will be like – particularly for children’s cycling – until we’ve been there. I’ve heard far less about cycling provision in Germany than I have the Netherlands or Denmark, but to be both blunt and blithe, we found Bavaria to have almost as good provision for cycling as the Netherlands, but with the advantages (for us as camping holiday-makers) of higher temperatures and better scenery! We experienced a wide variety of cycling environments. This included dedicated cycle routes alongside many bigger roads, signed cycle routes on very quiet rural back roads, and – within towns – lots of space shared (with no obvious conflicts) with pedestrians. Our upland rural itinerary also included lots of forest tracks – these would often start out (near to a village) as a surfaced lane, before switching to a loose gravel track through forest, and reverting to a smooth tarmac surface ‘on the other side’, as we approached another village. Uncertain as to how Flo would cope with hills, we’d anticipated staying on flatter ground to the north of the Alps. But it quickly became apparent that she was up to any challenge we might throw her way so long as we kept daily distances appropriate to her age – our longest day was around 55 km (or 35 miles) and most days we rode more like 35 km (or 20 miles). So we rode into the heart of the Bavarian Alps, into Austria and out again. 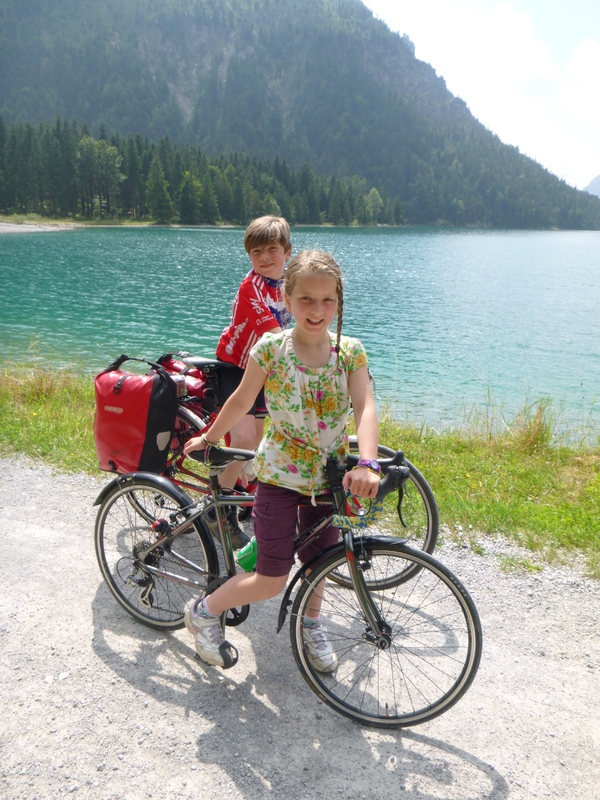 Flo’s surprising and unwavering appetite for cycling forced me into realising how children – including our own children – are capable of so much more than we usually imagine. Provide them with appropriate opportunities and support to do something, and they can and probably will do it. So I think the moral of this cycling tale is this – provide children with safe and supportive places to cycle, and of course they will (love to) ride. During three weeks we had only one day off the bikes. 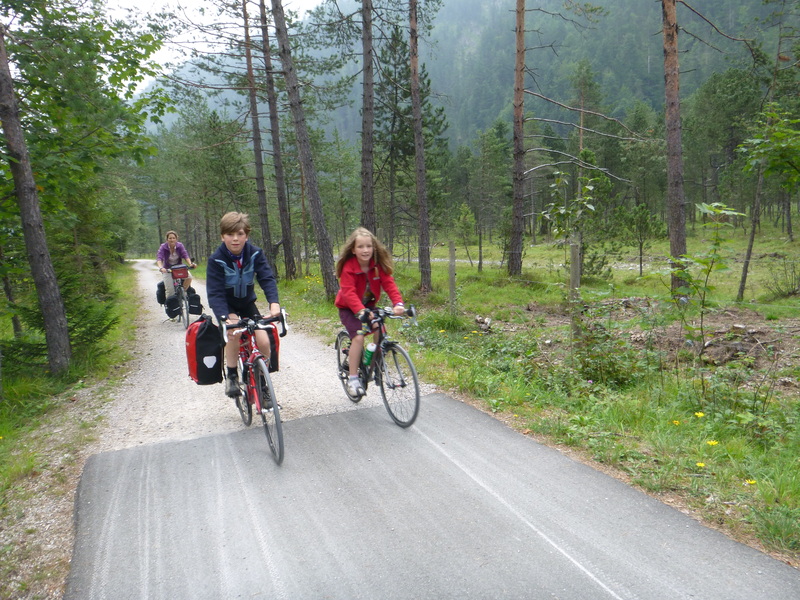 We’d expected to have more, but even when we camped at the same place for a few days, we’d use the bikes to get around – visiting nearby towns such as Bad Tolz, Mittenwald and Fussen. Bavaria lacks a coastline. Nonetheless, water’s everywhere – and people know how to make the most of it; in the summer heat they flock to the region’s lakes and rivers, and we did too. But guess what, on our rest day, the kids wanted to do? Ride surf-bikes! By the last week Flo was riding in ways I’d have no thought possible only a few weeks before – descending hills at 30 miles per hour, climbing up them with both grit and composure, and handling her bike over rough, rocky roads. Over three weeks she rode 400 miles. And in all that time there was not one close and/or uncomfortable encounter with a motorised vehicle. Holidays are different from everyday life; often we are in less of a hurry, we are keen to see ‘the best side’ of people and places, and we tend to go to places we think we’ll like. Holidays can also sow seeds of dissatisfaction with ‘ordinary life’; they throw new light on ‘things as they usually are’. This is something we badly need in Britain – more people (including, but not only, so-called ‘decision-makers’; we’re all decision-makers) seeing what cycling elsewhere is like, and thus what it can be like, even here. Then agitating to make it happen. That our idyllic Bavarian cycling holiday experience could be replicated anywhere in today’s Britain is utterly inconceivable to me: there isn’t the provision to keep cycling separate from fast-moving motorised vehicles; and not enough courtesy, care and consideration towards cycling and cyclists has been structurally embedded in ordinary driving practices where motorised vehicles and cycling do co-exist. So back home in Lancaster, England, Flo’s freedom to ride has been curtailed. She moves around independently on foot in the immediate neighbourhood (and Bobby moves around independently by bike further afield, but only to quite a specific and limited set of places). But she’s no longer routinely using her bike to move around. Although she’s become a great little cyclist, we’re refusing her that independence. A nine-year old girl moving around an urban area independently by bike? It seems outlandish, doesn’t it? But it’s not outlandish across much of the Netherlands, Denmark and Germany. In a small town south of Munich, I know for a fact that it’s not outlandish for a girl a good deal younger to be moving independently by bike. Flo should be moving towards independence over the next few years. As part of that move, I aspire to her being able to move around her town by bike. But how many teenagers do you see cycling where you live? How many teenage girls? The outlandishness of the idea of young people cycling independently is a sign both of how badly we’ve lost our way in organising our urban spaces for movement, and of how far we’ve got to go in creating sustainable, democratic and convivial urban space. I want to make clear what I mean here; I am not barring my children from cycling. I encourage them to cycle all the time, and they are both fantastically good cyclists, Flo much more so after three weeks of ‘fast-tracking’ in Bavaria. It is the conditions out there which bar them from using their bikes when they want and where they want. As adults and parents with a duty of care over them, Sue and I respond appropriately, by refusing them the freedom to cycle. There is no choice here. The language of choice, in which many people who say they are promoting cycling continue to engage, is poisoning cycling’s future. We must move away from it, because it is a lie – when it comes to children’s cycling, we have exterminated agency. Until we recognise and rectify this, we will have no democratic culture of everyday cycling, let alone children’s cycling, in Britain. We are an extremely pro-cycling, and fairly adventurous family – unusually so, I’d say, without wanting to appear arrogant, proud or pious. If we don’t let our kids ride through streets which they know by bike, I don’t think anyone (in their right minds) will. But of course, as someone who loves cycling and wants his children to cycle, I am very unhappy about this situation – unhappy, frustrated, angry and sad. 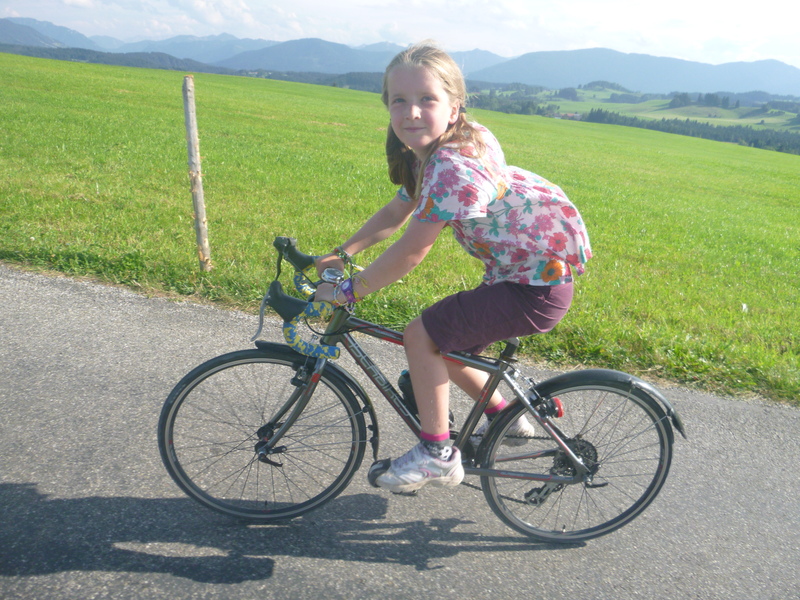 How lovely it was to see my nine-year old daughter, at the end of our holiday, pedalling amongst Munich’s early morning commuters. For three weeks she’d participated in a mass culture of recreational cycling; now she was tasting an urban culture of mass utility cycling for the first time, and you could see the thrill and delight coursing through her cycling body. So the moral to this tale is obvious, and it’s one which I’m pleased to hear being repeated regularly and in many places right now. If we’re serious about accomplishing a cycling culture, we must create environments in which people can accomplish cycling and become accomplished cyclists. But I have come across this moral tale so often lately that I’m also beginning to find it a bit worrying. So many of us are saying the same thing, yet still so little is being done. Bradley-based momentum and Olympic excitement can’t last forever; we need to take advantage of them, with actual gains – gains which extend beyond the backwards-facing incrementalism which we’ve all become so accustomed to; gains which reach towards that radical re-structuring which so many of us recognise is really needed – NOW. At the end of a summer which has seen so much British women’s cycling success, the project of encouraging Flo to continue cycling goes on. For now she’s thriving on the new-found sense of herself as fit and feisty Flo. On Thursday evening down at our local cycling circuit, Salt Ayre, she lowered her two-mile time trial personal best. But Sue and I know, even if Flo herself does not, that bigger forces are set against her. I don’t know how much longer Flo will pedal, but I do know that the answer is for now very largely out of her, or (as her parents) our, hands. The answer depends on what is done for cycling, by people who she’s never met and via processes which she doesn’t understand. Her mobility future, her health and well-being – just like the mobility future, health and well-being of her entire generation – lie in their hands. It shouldn’t be the sole and it’s probably not the most sophisticated strategy, but at some level I trust that if only we can keep shouting, they might just start hearing. This entry was posted on September 3, 2012 at 4:28 pm and is filed under CYCLING PROMOTION, CYCLING THINKING. You can follow any responses to this entry through the RSS 2.0 feed. You can leave a response, or trackback from your own site. Fully agree with all you say (although if we push for Dutch-style infrastructure we might get it watered down to German-style, which would be OK, if we push for a lower standard we’ll end up with the rubbish we have now). We too have children who love cycling (almost all children seem too, it’s a naturally efficient and fun way to get around!) and are terribly frustrated with the lack of places for them to ride. We can, just cycle into the local shops, but this still involves a lot of pavement cycling and getting off and walking. We ride to and from school, but only with them on trailer bikes (and even that’s scary sometimes with cars coming too close). Of a school of around 400 pupils, all living within a couple of miles, only three pupils ride bikes to school most days: less than one percent. Where we have decent, safe, facilities, such as NCN2 (in parts) along the south coast, and Worthing’s lovely wide Prom, children and people of all ages can be seen happily using bicycles for local transport. Elsewhere a few people ride bicycles in spite of the terrible conditions, but for the vast majority it’s just far too dangerous to contemplate. Is the UK the most bicycle-unfriendly country in the world? Thanks Fonant. And I fully agree with you too! We must push for Dutch standards, in the hope that we move towards the German (or rather, Bavarian – because I don’t know too much about the rest of Germany, from first-hand experience anyhow) situation. Quite often the cycling provision we used reminded me of poor UK provision, but with the poorness somehow ironed out, if you know what I mean? It’s terribly depressing, isn’t it, to think about how tremendously high must be the levels of suppressed cycling amongst cycling-hungry children? As you say, if people like us find cycling difficult, what hope for others? I don’t at all want to be negative – there are (growing?) examples of good provision, which is great, and to be encouraged. But one problem with the emerging pockets of good cycling provision – maybe such as Worthing (I don’t know it, so please, tell me), certainly some of the car-free corridors around here (Lancaster) – is so many people get to them by car; my worry is this contributes to rather than discourages a culture of driving as ordinary, whilst cementing cycling as an (occasional, elsewhere) leisure much more than a (regular, here) utility practice. I know it’s been said before, and that you already know it, but it bears repeating – as cycling advocates, I think we need to become much bolder in pushing for quality (Dutch-style) cycling provision not only in ‘nice’ and ‘easy’ places, but also and much more importantly and urgently on our doorsteps. I’m not sure if the UK is the most bicycle-unfriendly country in the world. (I’ve a vague memory of the lovely and very well travelled round-the-world cyclist Alistair Humphreys telling me that Serbia was absolutely atrocious!) But it must certainly rank amongst them. And surely now, it’s the most schizophrenic. A few years ago I’d have given that accolade to France (the French so love cycling, yet do it so little); but with our ‘victorious summer of cycling’ alongside our mean streets, I think we’ve taken over the mantle – and unlike France, there is no ingrained culture of good will and courtesy towards cycling here. I think we should recognise the positives, for undoubtedly there are some. But at a time when so many people seem to be ‘talking up’ cycling, and either lazily or naively assuming we’ve somehow magically become a ‘cycle-friendly nation’ (just because we’ve suddenly found out quite a few Brits can ride a bike fast!? ), it’s also incumbent on us to keep pointing out how much is still so wrong, and needs to be done. We need boldly and effectively to communicate how much more ambitious for cycling it’s possible to be. We risk being named ‘kill-joys’, people who are never satisfied. But I’m not satisified, yet, not by a very long way. Sorry for the long response! But thanks loads for reading, and commenting. Thanks spandelles, it’s very kind of you to say so. I worry slightly that a 3,000 word post is just too long; so few people are going to find the time and make the effort to read it. So it’s nice to hear from people who appreciate it (though I’m not assuming you wouldn’t also appreciate my making them a bit shorter too!). All words that precisely reflect my feelings as well, especially now my daughters are almost old enough to cycle independently, if only our society wasn’t so sickeningly addicted to the car. There are certainly some small signs of change, but I see few reasons to be confident that conditions will really improve before my children become adults. Sadly, I see their best prospects in future being to leave the UK and I will encourage them if they choose to go. They can pay their taxes in a country that cares about its people. Thanks Don. I must admit, I occasionally think – especially now both my partner Sue and I are self-employed and so not especially tied to any particular work location – why on earth don’t we move to the Netherlands? I love cycling, I want my kids to cycle, and I’m inspired by a society which so organises itself around the bicycle. But then there’s so much, isn’t there, which remains good about Britain? And if we give up on cycling’s future/s here, who will do the required work (even if that’s ‘merely’ by continuing to pedal in the face of so much hostility) to make Britain a truly cycle friendly place? I don’t want my kids to ride on today’s roads, so I’ll do what I can (and we all have limits) to make tomorrow’s roads better places. And it’s probably people who know what cycling is like elsewhere, and so what it can be like here, who are best placed to do some of that work. So please, don’t despair completely. I think it probably will take our lifetimes, but together we will make Britain a more cycle-friendly place, for our children and their children. I’d just like to pick up on one aspect of your piece: the bodily discomfort cycling can bring about. I too was in Bavaria this summer and then the Austrian Tyrol. One thing I noticed was the large number of electric bikes, particularly in the Tyrol. To a committed cyclist, electric bikes might seem like cheating, but by addressing the ‘problem’ of bodily discomfort, they have the potential to increase the numbers cycling and thereby raise the profile of cycling and make it more mainstream. Surely it is no coincidence that in the UK the areas with the highest levels of cycling tend to be flat, e.g. Cambridge, York and Oxford. Two years ago I was in Belgium and met a Dutch couple. One rode an ordinary (proper?!) bike and the other, who had a disability, used an electric one. This enabled them to continue cycling together. This illustrates, perhaps, a more laudable benefit of the electric bike: it allows people to carry on cycling when physical impairment would otherwise prevent it. Great point Graham – thanks! There are issues here though, aren’t there? In general, I agree with the thrust of your comments, and I certainly would hope to ride an e-bike if ever I became unable to ride a ‘standard’ one. But I can’t help feeling towards e-bikes a bit how I feel towards ‘green’ cars: at one level, a great idea (and undoubtedly, for some people, absolutely brilliant), and undoubtedly one important component of a sustainable society; but at another level, I’m a bit suspicious – because (similarly to ‘green’ cars) if they catch on too quickly, they’ll prevent some of the more fundamental work (at the personal but more importantly the societal level) required to transition us to genuine sustainability. In the case of ‘green’ cars I see more fundamental work as centring around reducing journeys, reducing trip lengths, and switching to non-motorised and more convivial modes of mobility. In the case of e-bikes I see more fundamental work as centring around the (personal and societal) reconsideration and revaluation of (key concepts of) distance, time, speed and physical effort. If we learn to love e-bikes too soon (and too early in (an able-bodied, physically fit) life), we’ll be given the opportunity to continue with our lazy, sedentary, non-active ways! So I don’t want to be PC and say ‘e-bikes are great’! But I do also of course want to recognise that if they make cycling (and so the ‘goods’ which cycling enables – such as fresh air, nature …) accessible to more people, for more of their lives, then they are clearly a good thing, and part of both cycling and sustainable futures. Am I being too protective of a particular concept of what cycling is, and ought to be? A bit over-zealous? Please, if you feel so inclined, be sure let me know! My wider point is that e-bikes may make cycling more attractive to individuals who are put off by the bodily discomfort of cycling. If these individuals swell the numbers of cyclists (using the term in a broad sense), then this moves us closer to that critical mass needed to fundamentally change attitudes and policy towards cycling. Furthermore, the environmental impact of an e-bike is considerably less than that of a car (green or otherwise) and so, if they replaced journeys made by car, would be a move in the right direction. Of course the e-bike has significant drawbacks for the rider. Compared to a ‘proper’ bike, they’re expensive, they have a limited range, they’re cumbersome and they don’t offer the same physical benefits to the rider. Given these limitations, I wonder if using an e-bike might be, for some people at least, a stepping-stone towards taking up ordinary cycling. I think that’s a very good point, when you say: “I wonder if using an e-bike might be, for some people at least, a stepping-stone towards taking up ordinary cycling”. I’d hope so. I guess the other thing to recognise is that e-bikes are likely to keep evolving, and to improve in performance (weight, range etc). There’s an academic project currently investigating the potential of e-bikes: “Smart e-bikes – understanding how commuters and communities engage with electrically-assisted cycling”, being led by Frauke Behrendt at the University of Brighton. It’ll be worth keeping an eye on that (I think the research is in-progress, so any definitive ‘results’ could be a while off). Nice piece. I agree wholeheartedly with your sentiments regarding your children, safety, infrastructure and the current dialogue surrounding cycling. Kudos to you for providing a lifestyle example for your children to follow. Families, Children and the Elderly are the barometers of our cycle worthiness and we must strive to build our community’s cycle facilities to address these most vulnerable users. For my sins, I read a lot of institutional documents to do with cycling – stuff such as government cycling policies, and reports on cycling. And it’s amazing how, in these kinds of documents, the dominant view of cycling – and given this is how it is so regularly and routinely constructed, this view gets continuously reproduced, reinforced and cemented – is of a solitary and utilitarian practice, principally of commuters. There’s a massive gap here – the government focus is on promoting the ‘unsociable’ cycling of working-age people, and principally the journey to work, perhaps mainly because it’s ‘good for the economy’ (but also because such solitary cycling is more easily fitted into the city as it is). But thereby many of the people who most enjoy cycling, including retired and so potentially more ‘leisure-rich’ older people, families keen on a ‘good day out’, and of course children, get forgotten. Yet working the other way (sorry, nothing – or very little, anyway – is ever that simple and straightforward for the sociologist! ), the best cycling facilities tend to be in ‘the countryside’. This is where those families, children and retired people thus tend to want to ride, but aren’t much good for the urban commuter. Meanwhile, our cities are generally awful, with woefully underdeveloped and/or threadbare (dating from previous ‘cycle-friendly’ institutional moments) patchworks of ‘a cycling network’ set within a stormy ocean of speeding cars, trucks and buses – hardy commuters ride there for reasons other than good cycling infrastructure, but children, families and older people are understandably almost entirely absent. I think there’s potentially an interesting, important and critical analysis here, waiting to be developed … But for now, suffice to say that Government is (tokenistically, but not actually) promoting urban utility cycling, whilst the majority of people who relish cycling and want to give it a go are voting with their cars (if they have one) and driving out to ‘decent’ (if generally linear and disconnected) cycling country (side) elsewhere. To genuinely promote urban utility cycling, in ways which not only recognise the humanity of all cyclists but also respectfully include older people, families and children, any changes would have to be a good deal more radical than they currently are. Sorry it has taken me so long to reply… You make some great points. After our tour through Czech Republic, which has wonderfully marked routes throughout the entire country, btw; we ( my partner Carolyn and I) have been talking lately about the advantages to small and rural communities of promoting Cycle tourism in these outer reaches… What amount of commerce is injected here that would otherwise be “going down the road” when travelling by car? 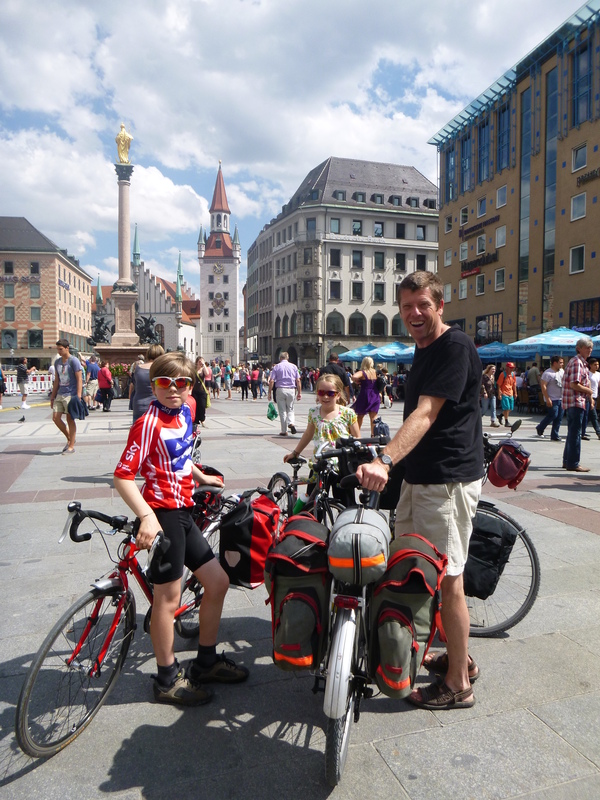 What positive social and cultural impacts result by travelling by bike, especially when done as a family or group? How could small communities independently promote Cycle tourism, even if surrounding urban centers, can’t or won’t develop adequate infrastructure…? Not to discount your points about interconnecting the central urban core to the countryside. this is a valuable part of the equation for promoting effective Cycle Tourism/Travel too. As you’ve alluded to a ‘potentially interesting analysis’ in this area, I’m curious what your take is on these impacts? No need to apologise! I know what it’s like 😉 And thanks SO much for setting out your thoughts. There’s been quite a bit of work done in the UK, and I’m sure elsewhere, about the benefits of cycle-tourism to (often struggling) rural economies. I’m afraid I don’t have specific details off the top of my head, but if you want me to search out a few references I’d be more than happy to. I think the basic point is the same as your hunch – that cycle-touring is really good for business: cycle-tourists are dependent on rather than (as car-based tourists might well be) independent of local businesses. It strikes me that, so long as you’re willing to discount the costs of their getting there (which I admit is a big ‘if’, especially when it comes to air travel), cycle-tourism is a pretty sustainable (and I’d be tempted to add ‘soulful’, as a way of trying to get to the ‘positive social and cultural impacts’ to which you allude) practice. I’m terribly sorry, but I can’t now get back to where my head was, when I responded to your previous comment! I sometimes get a sense of an analysis emerging, but I don’t develop it enough; and then, alas, it’s gone! (This is I think one of the weaknesses – for someone who enjoys gradually developing certain lines of inquiry – of blogging, certainly if it becomes *instead of* more disciplined, considered, sustained thinking and writing.) But I’ll be sure to let you know if I recall what on earth I was thinking! Dave, Do not dispair! Cycling is not the only thing that will give you gendered angst in child rearing. I was ‘forced’ to cycle as a child, but none of that racing nonsense. Just relentless weekend bike rides around the countryside all the year round with cold and hot picnics. But I never cycled on my own until I was about 14. In fact it never even occurred to me that I could or would want to. I walked on my own. That was fine. I continued to cycle, and probably because I never learnt to drive I have always done so. Mainly for leisure, but sometimes for commuting. Where cycling is a normal family activity, my guess even if you cycle less in your teens/early twenties, you will probably take it up again later in life. The big problem in number of miles for women comes with children, as they are more likely to be looking after them and have less free time for leisure cycling without them. As for the competative role modes, are they that important? I think not. However, William is glued to tour highlights highlights each evening, and Robert and Oliver have pretend to be their cycling heros with their first wobbly indepent rides along the Bristol -Bath cycle motorway these last few weekends. At least you have some nice country lanes to cycle on near you, and make keep going out as a family despite any negative whines. They alway enjoy it once they are out, and have put their parents through at least 10 mins of considerable stress! And if it helps I won’t be allowing my sons out on the urban roads alone until they have some degree of sense – maybe about 18? It’s good to hear that you’re persevering too! My main concern is how the cycling environment has changed, and continues to change, over the last half-century; and I want (occasionally) to use the prism of parenthood and my growing children to explore and critique that. (These vantage points matter, and are too often ignored.) I was returning from a long training ride with Jon Barry on Sunday, descending into Halton from the Redwell Inn. Four lads, maybe ten or eleven years old, were pedalling – quite slowly and slightly erratically – up. What a rare and great sight! Of course, we hailed and encouraged them. But I also felt slightly perturbed. Was it only their (and their parents’) naivety which allowed them to ride up that road (I ride it often, and I know how fast some people drive it, and how close they’re happy to come as they fly past)? Or have I just become part of the ‘fear-mongering’ culture which (in my article ‘Fear of Cycling’) I once critiqued? I had my first taste of independence by bike – Easter 1980, aged 12, I did a three-day cycle-tour of the Cotswolds with two friends; the next Easter we went to the Peak District. Even then, I think my parents were quite relaxed/brave, allowing me to go (and I have them both to thank for – inadvertently – helping to produce my love for cycling). But that was a generation ago, and car ownership and use has ‘rocketed’ since; roads on which cycling back then seemed plausible have, in the intervening thirty years, become much less hospitable to cycling. As a society, I think we cannot be seriously promoting cycling until we tackle this situation. I understand (and accept) the reasons, but for too long cycling advocates have been too happy to be given tokens, and to look for and greet little signs of ‘cycling progress’ as ‘reasons to be cheerful’; even whilst the rising tide of ever more impatient and aggressive cars, buses, HGVs has extinguished most cycling which existed and suffocated cycling’s roots (in succeeding generations). This would be reason enough to be upset, angry and desperate to fight back (cycling is good, we love it and want to defend it); but in a world which seems set to sink in the fat of its affluence, it’s an absolute bloody disaster! My advocacy is not gendered – let’s please let everyone feel able to cycle, whoever, wherever and whenever they are. But in a UK cycling world which is so obviously and heavily gendered (whether we’re talking sports cycling, recreational cycling or commuter cycling), then I think our analyses and critiques have to be gendered (although too much focus on gender risks losing the significance of other things). I’m down in Bristol next week – giving evidence to the City Council as part of an inquiry into cycling safety. So if you’re around and up for a coffee Friday morning (before I leave around midday), give me a shout. Hope you’re all good, and you keep all your ‘boys’ on the road, if not the big and busy ones! Now they have reached 12 and 15 they are not taking to their bikes nearly as much as I would like except that my older daughter has just discovered the freedom that a bike can bring. She may have given up racing, is no longer that keen on long rides with her Dad at weekends and these days very rarely brings me catalogues with bikes or kit circled near to birthdays and Christmas but she does ride to see her friends. Admittedly we live in a rural part of Lancashire and so the traffic issues are not the same as those in the town. Nonetheless, most of her friends think she is slightly deranged. None of them would dream of getting on a bike and cycling 8 or 10 miles to their friends’ houses. I am pleased that what we (I – my wife hasn’t been on a bike in 5 years) inculcated in early years has stuck with her to a degree. If only I could teach her how to change a punctured inner tube! I hope that her little sister might follow suit but her road sense and general awareness are not yet up to being allowed the same freedom. We have signed posters and photos of Nicole Cooke, Victoria Pendleton, Emma Pooley and Sarah Storey. We follow the exploits of the women’s series as best we can via the limited media coverage it is afforded and yet we are, as you have indicated, fighting the gender agenda. I believe you may have hit upon something regarding the acceptance (embrace) of ‘physical discomfort’ but even more so we see the eschewing of sweaty lycra in favour of ‘cool’. I have tried to persuade them that they can ride in ‘normal’ clothes but have to admit that tight jeans do chafe a bit! Fight the good fight Dave and Sue. And if you choose to move to Holland (or better still Bavaria) can we come and visit? Thanks very much Jonathan, for those brilliant descriptions and insights from your own experiences. You’re a few years further on than we are, with your two children, and it’s fascinating (also a bit sobering, but also quite inspiring – because cycling still clearly matters …) to hear what we might have in store. There’s a lot to unpick in what you say, for sure, but I guess the big thing – isn’t it – is that your daughters dwell in a pro-cycling domestic ‘cocoon’ which is inserted within a much bigger culture which – and especially with adolescent girls, perhaps – is indifferent (or even a bit hostile) to cycling? I think this adolescent ‘anti-cycling’ culture can only begin to be broken down by obviously and visibly elevating cycling’s place in society, through making it much easier and more convenient to cycle whilst simultaneously making it much harder and less convenient (and also a bit embarrassing?) to be driven (by parents). Once that starts to happen, I can imagine children who cycle will gradually start to be ‘re-configured’ (sorry, that sounds horrible – what I mean is ‘seen differently’ in everyday discourses) away from ‘eccentric’/’odd’/’distinctive’ towards ‘pioneering’/’cool’/’distinctive’. Catch you soon, and thanks loads for reading AND commenting (and so eloquently). One of the really striking things about our trip to the NL last year was the number of teenage couples you saw on bikes (or off their bikes … sometime you’d spot a pair of bikes abandoned by the path, and teenage couple canoodling under some handy bridge or sheltered spot not too far away). Where cycling is normal, of course teens would want to go out together on their bikes, no need to ask Mum and Dad to ferry you with all the awkward questions that entails! Fancy another tour of London one year on? You’ll notice the difference Dave. Made this little film on London’s A-roads. Cheers Dave, lovely film. I especially like the green bicycle light and ‘go London’ at the end – very poignant. And of course, I agree with you – things are happening. Your footage of the afternoon commute, especially, is impressive – the number of cyclists is something I’d never have imagined, when I rode regularly in London some twenty years ago now. And of course, the number of people now riding just has to produce other effects which would have previously been unthinkable. And I know you’re not going to stop doing your fantastic work, but we’ve got to keep pushing, take advantage of the momentum, haven’t we? You know and I know that those motorised vehicles (on the A6?) are still travelling too fast, and they still have too much ‘right to the road’. But London is getting there. (And I’m just back from Bristol, which also seems to be ‘getting there’.) I would love to take you up on your offer of riding London’s streets again. Now I’m ‘freelance’ (i.e. much more likely to do stuff if I can make it pay ;-), I need to figure out a way in which I could make it work financially, if only to cover costs of train fare etc. Any ideas of places to which we could pitch a jointly authored article, and how we might frame it? (I’ll put my thinking cap on and get back to you if I come up with anything!) It would though of course be lovely to see you, to swap stories and ride together. Great article and great blog, really enjoyed the cycling and safety article too. We live in Oxford and I think are lucky to be somewhere with a tradition of cycling and a reasonable infrastructure as a result of a cycling friendly local authority, especially in the past. We also have a Sustrans regional office in Oxford and they do a great job of working with local authorities to improve local infrastructure and also directly with schools through initiatives such as Bike It officers. 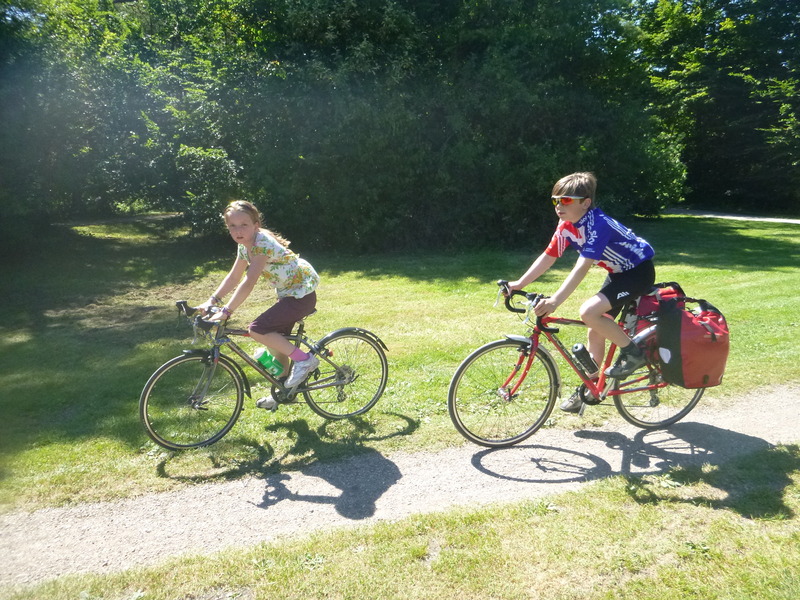 Our three daughters are all keen cyclists partly as a result of us cycling with them but also because their secondary school, Cherwell School, has always had a policy of encouraging children to cycle and has one of the highest rates of cycling by pupils in the country. It really helps that there are good, dedicated cycle lanes and paths more or less throughout the school catchment. But the school has always had a committee dedicated to transport policy with a good number of cyclists ‘on board’. As a result, there have been initiatives like working with a local cycle workshop to encourage the less abled kids to learn cycle mechanics, the school has worked with the local authority and private providers to offer cycle training and cycle maintenance and they now offer cycle polo I think. It must help that Oxford has a strong cyclist lobbying group, Cyclox, and also a number of thriving local CTC groups. Once our daughters reached teenage, they realised the freedom a bike gave and they absolutely refused to be taken anywhere by car – even on a night when the rain is bucketing down and they are off to a party, they will seriously argue and demand to be allowed to cycle. The oldest, now 27, is into mountain biking in a big way. I do remember having to swallow my horror when she wanted to cycle in a frilly, long dress and it took a while before she realised why trousers might be saner. Never argue too hard I discovered. One of the others, now 20, is in the US on an exchange at the moment through her university and she tells us that there, all students must do two internships each term and so she is working in a bike shop which collects and recycles bikes and loving it. We are looking forward to her return and to handing over our maintenance needs! Just saying that though reminds me that one of the things about being a cycling parent is the need to know how to buy your kid a decent bike and secondly, be prepared to keep an eye on the state of the bike and to do the regular maintenance necessary to keep it safe and rideable. I’ve never seen so many people or kids cycling and I am very optimistic for the future on this score though the level of hostility on our roads from drivers towards cyclists can be horrifying. But it does feel like we are now on the crest of a wave and with enough interested and encouraging adults and with organisations like Sustrans and the CTC and, even, government backing, I am keeping my fingers crossed! Thanks Ann, for your compliments on my blog, and for sharing your own experiences. They are great to hear, and very inspiring. Well done on (so far) passing cycling on to the next generation so successfully. Unfortunately we have got a bit of a gap I think, haven’t we (though probably a lot less so in Oxford than somewhere such as Lancaster), where the parents of many of today’s children have only very limited – if any – experience and knowledge of cycling; so it’s being left to ‘outside experts’ (i.e. Bikeability instructors, Sustrans Bike It officers) to enthuse and encourage kids to cycle (and then enthuse/encourage their parents, rather than vice versa!)? It’s great to hear your optimism about cycling’s future – on the whole, I agree. But I also think we need to remain aware that bucketfuls of pro-cycling sentiment don’t translate into pro-cycling action, unless we agitate for and demand it. So we have to make sure that we strike whilst the iron is hot!! Hi Dave, I do of course agree with you re needing to be proactive and I know we are lucky to live in a city with a high level of cycling and reasonable provision. Interesting what you say about cycle training, I went and did the cycle instructor training and did a bit in the schools and a bit of adult training but it’s very hard to get people to take cycle training seriously. I think I am a miles better cyclist for having done the training and I am horrified at what I see cyclists doing. I don’t mean the anti-social bit of riding through red lights etc but simple stuff like looking over their shoulder before pulling out, signalling clearly, not riding out of side roads without looking, not going down the inside of buses and lorries. I thought your piece where you talked about in and out groups and the perception of cyclists as an out group was one of the most interesting pieces I had read around the subject of hostility against cyclists in the UK. I can’t help thinking that the anti-social behaviour bit combined with simply not behaving assertively and correctly on the road must add to the perception that cyclists are anarchists and don’t know what they are doing. I wrote a dissertation once for a masters course on cycling in the 19th century and the conflict between stage coach/wagon/cab drivers and early cyclists. For a while there was war on the roads between the two and many of the criticisms of cyclists were the same as now, eg. cyclists illegally riding on footpaths! We are a small and crowded nation and I personally blame Maggie Thatcher and her ilk for adding to an already entrenched conservatism and thus individualism as opposed to our more communally minded European mainland neighbours. I always think the French official anti-terrorist warning sign says it all – they have three figures forming a closed circle saying look after each other, whereas we have ‘look out for yourself and don’t trust anyone’! Sorry to rattle on anyway, a bit away now from children and cycling but thanks for so much stimulating stuff.